Approximately 275 million people worldwide live fewer than 10 kilometers inland from ocean beaches, or 30 kilometers inland from coral reefs. Because of their relatively close proximity to coral reefs, they manage to reap the greatest benefits: fresh seafood and income. 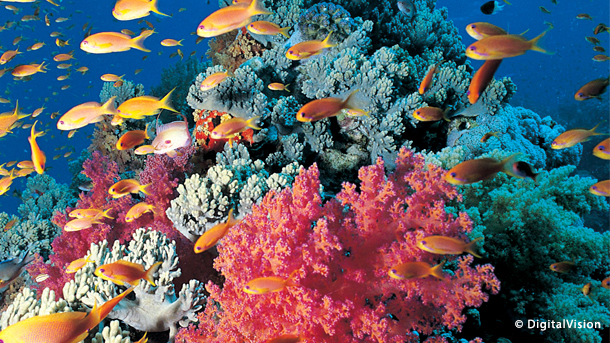 Well-managed coral reefs can provide habitat for 5 to 15 tonnes of fish per square kilometer, making their financial value for the industries of marine-fishing, tourism, and even ocean protection around $30 billion. In the Sidi Salem district, the trade is valued between 5 and 10 million Algerian Dinars ($4,500 to $9,000 USD) per day. The Algerian coral is smuggled through Oum Teboul and Laayoune, where Tunisian smugglers receive and transport it to secret workshops in the Tunisian city of Tabarka (on the Algerian border), or the island of Djerba (southern Tunisia) where half of it is manufactured for various purposes, and then typically smuggled to Torre del Greco near Naples, where the ‘coral mafia’ is active. The quantity of coral smuggled from Algeria is estimated to be 2,000 kg per year, and this amount includes dozens of rare coral branches. Every year between Algeria and Tunisia, anywhere from 250 to 300 smugglers and illegal hunters are caught and arrested. Their coral is sold in Algeria for between 70,000 and 80,000 Algerian dinars, while its actual gathering price ranges from 800 to 1,500 Euros per kg and 15,000 Euros for a single coral branch.